Ann Arbor Downtown Development Authority board meeting (Nov. 3, 2010): The DDA board passed a single resolution at Wednesday’s meeting: to reorganize its committee structure to include a communications and economic development committee. But board members heard a series of reports, including a look at the financial picture from the first quarter of FY 2010. Fund balances are lower than they’ve been historically – something the board knew to anticipate with the construction of the new underground parking structure along Fifth Avenue. The report from the capital improvements committee indicated that the project is proceeding apace, with headway being made on solving a problem with de-watering the site. During public commentary, the board heard from proponents of putting a community commons on top of the underground parking garage once it’s completed. At the meeting, the board indicated that they’d take an extended look at their 10-year budget projections at a board meeting in early 2011. Affecting the DDA’s 10-year plan are at least two major items: (1) the Fifth Avenue underground parking garage construction, and (2) ongoing negotiations with the city of Ann Arbor on the amount of “rent” to be paid by the DDA to the city as part of the parking contract under which the DDA manages the city’s parking system. Other reports from the meeting with a potential effect on the DDA’s budget included an update on the City Apartments project planned by Village Green and located at First and Washington. The DDA is slated to purchase the parking deck component of the project on its completion – for $9 million. Included with the board’s packet were a series of proposed amendments to the parking agreement between the city of Ann Arbor, Village Green and the DDA. Village Green is scheduled to complete its purchase of the First and Washington parcel in May 2011. Other potential impacts to the DDA’s budget included a report from the board’s partnerships committee that noted a request for grant funding from the Ann Arbor Housing Commission, plus an additional grant funding request from the Shelter Association of Washtenaw County. The report from the board’s transportation committee included discussion of enhanced service between Ypsilanti and Ann Arbor, as well as the possibility of adapting the #17 route to serve a partial circulator function for downtown. Also related to transportation, the board received a presentation from Pat Cawley, a city of Ann Arbor traffic engineer, on the installation of a new HAWK pedestrian crossing signal at the intersection of Chapin and Huron. The board also heard from representatives of the Main Street Business Improvement Zone on the delivery of a blueprint for creating other such zones in the downtown. The DDA’s financial state was a major theme of the meeting. Roger Hewitt gave the report from the operations committee meeting. Highlights of that report included an end-of-first-quarter report on the status of the four funds that make up the DDA’s budget: TIF (tax increment financing), parking, parking maintenance, and housing. Hewitt noted that there is some fluctuation based on the payment of construction invoices and reimbursements from the city. Hewitt pointed out that TIF fund revenues were slightly less than expected. After the first three months of the fiscal year – July through September 2010 – projections are now that $3,850,000 will result from the DDA’s capture of a portion of downtown property taxes. The DDA’s budget calls for $3,935,790 to be collected, or 2.23% more than currently projected. Hewitt noted that this was less than 3% variation. Capital expenses to be paid out of the TIF fund, Hewitt said, would include payments on the Fifth and Division streetscape improvements and would at this point be estimated to come to a total of $2 million for the year – the budgeted amount was $2,020,753. Based on first-quarter reports, parking revenues are now expected to total $14,635,108, or $378,818 less than budgeted. Hewitt noted that the difference between current projections and the budget amount – which is 2.59% – is still less than 3% variation. Hewitt attributed the shortfall to the fact that the budget was made based on an assumption that parking rate increases would be implemented starting July 1, but the increase had been delayed until Sept. 1. Joan Lowenstein asked if they would see an uptick in hourly patrons for holiday shopping. Joe Morehouse, deputy director of the DDA, indicated that yes, this is typically the case. Russ Collins noted that for the first quarter, revenue had shrunk by 1/4 of 1% and hourly patrons had decreased 3%. He concluded that this reflected the fact that there is still demand in the system. John Mouat was curious to know why the Maynard structure showed an increase in the number of hourly patrons, but a decrease in revenues. The explanation was that Maynard had been used for construction parking for the University of Michigan North Quad, with up to 100 construction workers a day parking there. Construction is now complete, said Hewitt, so it will take a while for people to get used to the increased availability of parking there. The board received an update on the City Apartments project by Village Green, located at First and Washington. The DDA is slated to purchase the roughly 250-space parking deck component of the project on its completion – for $9 million. Included with the board’s packet were a series of proposed amendments to the parking agreement between the city of Ann Arbor, Village Green and the DDA. 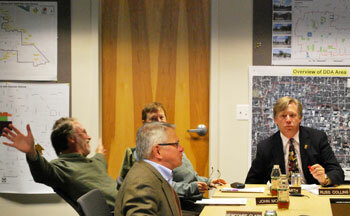 At its Aug. 5 meeting, the Ann Arbor city council authorized an extension to the purchase option agreement with Village Green, and that authorization included a series of milestones, which is intended to result in the completion of Village Green’s purchase of the First and Washington parcel in May 2011. The milestones call for a parking agreement to be executed by the DDA by Nov. 21. DDA staff have made a number of recommendations for amendments to the parking agreement with Village Green. At Wednesday’s meeting, Susan Pollay, executive director of the DDA, noted that the amendments were intended to ensure that the parking deck would be completed with the specification that it have a 75-year life and that copies of all relevant environmental reports and certifications would be provided to the DDA. John Splitt encouraged board members to have a look at the draft of the Village Green amendments, saying that he wanted to have as many eyes on it as possible. The operations committee report wound up with a discussion of the DDA’s 10-year plan. Russ Collins noted that the document contains the financial projections for the next 10 years and is constantly revised. Roger Hewitt confirmed that it was revised regularly, and he indicated the revision schedule was every three months. Collins noted that the document was not some kind of narrative or mission statement, but rather deals with hard numbers. The conversation from Collins and Hewitt noted that there would be three or four years in the near future with fund balances that are significantly lower than board members are accustomed to seeing. At the Jan. 5, 2011 board meeting, there will be an extended operations committee report, to walk through the 10-year plan. Joan Lowenstein asked that board members who might not be able to attend on that date – due to the holiday period – let her know so that the meeting could be rescheduled if necessary. By way of background, the projected fund balances for the DDA were the subject of scrutiny by city of Ann Arbor CFO Tom Crawford in early 2009, when bonds for the underground parking garage were authorized by the city council. His concerns had resulted in the downsizing of the project by 100 spaces – the extension of the underground excavation to William Street was eliminated. The benefit that proponents had claimed for the extension was the ability to create an underground connection from the parking structure to whatever development might be constructed on the Fifth and William street lot [aka the old Y lot] and to the Ann Arbor Transportation Authority’s Blake Transit Center. The proposed structure would occupy area under Fifth Avenue. But [Carsten] Hohnke expressed concern that the cost of an extension along Fifth Avenue southward past the southern edge of the library lot all the way to William Street (part of the current plans) didn’t offer commensurate value for the investment. He was concerned that the cost would constrain the DDA in making other needed investments. He said that while there’s no doubt more space is required, he thought that the roughly 770 spaces to be built exceeded what’s required. [Sabra] Briere continued her questions with Crawford. Q: Is the plan before us – even cut down by $6 million – within reach of currently available funding? In the current version of the DDA’s 10-year plan, the combined fund balances for the parking fund and the TIF fund are shown as negative for FY 2011-13. But combined fund balances for all four funds – including the parking maintenance fund balance and the housing fund balance – would be positive for the 10-year period. The current 10-year plan assumes a $2 million payment to the city each year – designated as a contingency. It also assumes that the funding of alternative transportation in the form of the getDowntown program’s go!pass would end after 2013 – that’s currently about a $500,000 annual program. The current 10-year plan also does not allow for continuation of the energy saving grant program or any housing grants after 2013. The future of DDA finances will be impacted by current negotiations between the city of Ann Arbor and the DDA about the amount of rent the DDA should pay to the city for the use of the parking facilities that it manages for the city. Roger Hewitt reported that the two mutually beneficial committees – from the DDA and the city council – had met twice in October. The two committees are renegotiating the contract under which the DDA manages the city’s parking system. At this point, he said, they need some feedback from the city council as a group. A work session on the DDA’s proposal for a development process would be held at 6 p.m. before the regular city council meeting the following day, Hewitt said. On Nov. 15, there will be another working session of the council to focus on the parking agreement itself. Based on The Chronicle’s observation of the October meetings of the mutually beneficial committees, among the central issues now under discussion are (1) whether the DDA should be able to set parking rates without a city council veto, and (2) how the amount paid by the DDA to the city might escalate – to what is now typically described in committee meetings as $3 million. The $3 million figure does not itself reflect an escalation, but rather the inclusion of the $2 million in “rent” plus the roughly $1 million that the DDA pays into the city’s street repair fund. The report out from the partnerships committee was given by Keith Orr, because the two co-chairs of the committee, Russ Collins and Sandi Smith, had been unable to attend their meeting. The report included a discussion of various grants. The DDA administers a grant program to encourage downtown property owners to invest in energy saving improvements. It includes an audit that’s paid for by the DDA and generally costs $2,000-$5,000. The program also includes a 50% DDA match on implementing recommended improvements – with a maximum payout by the DDA of $20,000 for each building. The audit is Phase I and the implementation is Phase II. Based on the materials in the board’s packet, the DDA has paid $298,818 since the start of the program in FY 2009. Including the DDA-paid portion, a total of $241,253 has been spent on installation of energy-saving measures. Orr reported that to date, 71 audits had been approved. Applications are currently available for this year’s program. At the partnerships committee meeting, the consensus reached by members was that they should proceed with the recommendation for the $218,050 worth of improvements, while holding in abeyance the approval of more than $113,210 for installation of solar panels and for computer hardware at the shelter. Committee members had concerns about the length of the payback period for the solar panels, which appeared to be much longer than the kind of payback on investments the DDA is familiar with in connection with its energy saving grant program. At Wednesday’s board meeting, Orr reiterated the concern that the committee had about approving the grant, noting that it was a projected 29.2-year payback period – relatively long. Orr also reported that the Ann Arbor housing commission had approached the DDA with a request for a grant. The housing commission, said Orr, maintains 355 low-income housing units across 17 sites in the city. The grant would specifically target Baker Commons, Orr said, which is a building located at the intersection of Packard and Main. The grant would be for a 50% match on $500,000, Orr said, and would be used for window replacement, hallway carpet, and parking lot resurfacing. The committee had not reached a decision about whether to recommend making the grant, Orr reported. The city-owned parcel known as the Library Lot is the location of an ongoing construction project by the DDA – an underground parking structure that will provide parking for 660 cars. 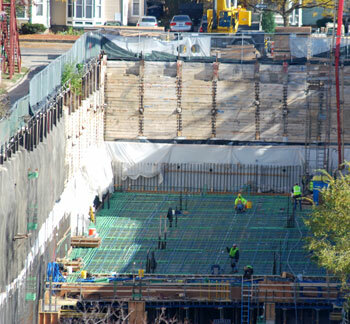 From the top of the Fourth and William parking deck, this is the view to the east, of the east leg of the underground garage as the first floor of the deck is getting poured. Reporting out from the capital improvements committee, John Splitt said that 300 yards of concrete had recently been poured for the first floor of the east leg deck. With respect to the de-watering problems that he had noted at the previous month’s meeting, Splitt said the water level is now dropping. This had allowed the foundation to be built for the tower crane next to the library. Once the tower crane is built, he said, the pace of the construction would pick up. John Splitt reported that the RFP (request for proposals) review committee had not met since the last board meeting. The committee has not met since the spring. Two people addressed the board during public commentary on the topic of the development of the top of the underground parking garage. Introducing himself by saying, “Hello folks, I think you’ve seen me before!” was Alan Haber. He indicated that he continued to talk to the community about the idea of a community commons on top of the underground parking structure. He was there, he said, to show them some drawings and sketches, made by Stephan Trendov, an architect and urban designer who also addressed the board. Haber stressed the economic benefits of a commons. He said the proposal was to maximize people space and subordinate automobile space. Trendov described himself as a “conceptualist.” The evolution of a city, he said, is based on water. He said that as he’s lived in Ann Arbor and walked the streets with people like Shakey Jake, he’s noticed that there is a “hardness.” It’s not the kind of city we want, he said. The concept for the top of the underground structure that he had sketched, he told the board, doesn’t interfere with the light wells that are meant to help illuminate the lower floors of the underground garage. His design also does not interfere with access to the underground levels or with future development of the site. At public commentary at the conclusion of the meeting, Trendov picked up on the theme of pedestrian amenities that Ray Detter raised in his report from the Downtown Citizens Advisory Council and their concerns about the alley connecting Liberty and Washington streets. Trendov warned that the University of Michigan had its eye on some of Ann Arbor streets – Monroe Street – and that it’s important not to let “the octopus” spread out further. Streets and transportation were another main theme of the board meeting. This was the issue that Trendov had alluded to during his closing public commentary. The current condition of the alley, with the smell of dumpsters placed close to it, was not conducive to use by pedestrians as a mid-block cut-through, Detter said. He stressed the need for all parties to carefully plan the future of the alley, and weighed in against a “helter-skelter” approach where only the developer of the hamburger joint on the corner played a role. John Mouat reported out from the transportation committee that they’d discussed service improvements between Ann Arbor and Ypsilanti with Chris White, manger of service development with the Ann Arbor Transportation Authority. The idea is to enhance service for those riders who work in Ann Arbor, but live in Ypsilanti. Route #4, he said, offered some interesting possibilities, including the idea of serving Blake Transit Center first, then the University of Michigan hospitals, instead of first serving UM, then BTC, which is how the current service operates. Mouat discussed the idea of looping other funding partners, besides the DDA, into the mix by offering challenge grants. The DDA’s transportation committee has in recent months also discussed the idea of resuscitating The LINK, which was a downtown circulator service jointly funded by the AATA, the DDA, and the University of Michigan. Riders did not pay a fare on boarding the buses. Mouat reported that White had discussed a possibility of altering Route #17 to increase circulation to the downtown area. Route #17 currently runs a loop up Division to the Amtrak station and back up Fifth Avenue. Mayor John Hieftje remarked that he felt even right-of-center voters were beginning to recognize the importance of transit and that there is a growing recognition that transit is something that southeast Michigan needs. Pat Cawley, traffic engineer with the city of Ann Arbor, appeared before the board to alert them to the installation of a high intensity activated crosswalk (HAWK) traffic signal at the intersection of Chapin and Huron. He described how for the last year or more the city had worked with the Michigan Department of Transportation on the project. It’s considered a pilot project, the first to be installed in Michigan on a state trunk line. He stressed the need for pedestrians and motorists to know what to expect. When not activated, he explained, motorists would see three black balls – two on top and one on the bottom. 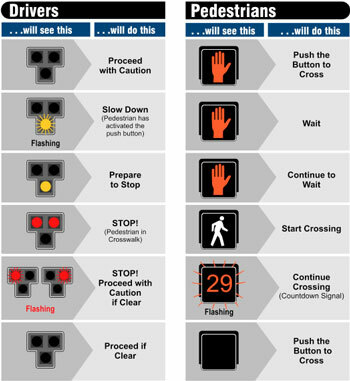 When a pedestrian presses a button to activate the signal, he said, there is some lag time for the signal to coordinate with other traffic signals. Then motorists see a flashing yellow, followed by a solid yellow, which is then followed by a twin-red solid stop beacon. Pedestrians get a seven-second white walking signal. That’s followed by flashing red for motorists and a 30-second countdown for pedestrians. Cawley indicated that the underground construction is done. It’s hoped that the ribbon cutting can take place on Nov. 17, he said. Asked after the presentation by The Chronicle if there was any potential for people to create mischief by simply standing and pressing the button, causing traffic to stop as a perverse entertainment, Cawley suggested that the delay – after the button press and before coordination with other traffic signals – and the length of the entire cycle would make that kind of mischief unattractive. Board chair Joan Lowenstein had indicated the possibility of a committee reorganization at the board’s October meeting. 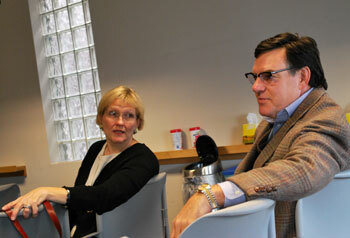 At Wednesday’s meeting, the board considered a resolution to reorganize its committees. The previous committee structure included committees for operations, capital improvements, partnerships and transportation. The new structure merges operations and capital improvements and creates an additional committee with responsibility for economic development and communications issues. merged operations/capital improvements committee: review financial statements; formulate budget; oversee parking operations; oversee parking agreement with the city; oversee construction. transportation committee: review getDowntown projects; personal transportation issues (bicycle parking, scooter parking, walkability); mass transit projects (coordination with the Ann Arbor Transportation Authority). partnerships committee: oversee DDA projects involving other entities like the city of Ann Arbor and the University of Michigan; housing fund expenditures; energy saving grant program; coordination with city council and the city’s planning commission. economic development/communications: background research for downtown redevelopment; inventory of city-owned sites; hiring of real estate experts and other consultants; facilitate process for development (public process and with the city council); assemble information on downtown’s assets for inclusion in promotional efforts of Ann Arbor SPARK, the regional economic development agency. Asked by Keith Orr when the new committee structure would be implemented, Lowenstein indicated that it would begin right away. Several board members expressed uncertainty about scheduling and their ability to attend a December meeting of the new committee. DDA executive director Susan Pollay suggested that things would “sort themselves out” and that board members with an interest in attending would make that known, and that the meeting time would eventually accommodate the schedules of those who wanted to attend. Outcome: The board unanimously approved a reorganization of its committees to include an economic development and communications committee. Ed Shaffran and Betsy Jackson appeared before the board on behalf of the Main Street Business Improvement Zone. The DDA had provided start-up support to the MSBIZ initiative – a self-assessment district, which property owners along Main Street, between William and Huron, had voted to approve earlier this year. Betsy Jackson and Ed Shaffran, who addressed the board on behalf of the Main Street BIZ, relax before the DDA meeting started. What about other downtown areas that might want to form a BIZ? In board discussion of the proposal, Sandi Smith had explained that out of the current proposal the DDA would get a template for creating other areas. In our phone conversation, [Ed] Shaffran suggested that another possibility was that other areas could be added to the Main Street BIZ. [The areas must be contiguous, according to the enabling legislation.] He said that the initial concept was to include the entire DDA district, but that they’d opted to start small and possibly expand. At Wednesday’s DDA board meeting, Shaffran led off by briefly thanking the DDA for their support. He told them that the provision of services had now begun – from 5:30-6 a.m., sidewalks were getting cleaned. He reported that there was already a noticeable difference in the MSBIZ area as compared to the rest of the downtown. He indicated that they were coordinating with the city of Ann Arbor on snow removal and developing procedures for dealing with snowfalls of varying amounts. Betsy Jackson gave a more detailed presentation on the MSBIZ strategy for providing a blueprint. The goals of the blueprint, she said, included: (1) creating an archive for the first BIZ, (2) providing details of the process for forming a BIZ, and (3) reducing grant requests to the DDA for the formation of future districts. DDA board chair Joan Lowenstein reiterated that the DDA’s intention in providing support to the MSBIZ was not simply to provide seed money for one BIZ, but rather to help develop a template for the creation of other districts.